In July of 2015 I told you about Norteños when some of its gang members were arrested at Rock Bay Landing. This came after an extensive investigation by the Victoria Police Department. Now, as I did a few days ago, I’m telling you that Norteños is in Victoria for pot shops and tent city. IF VICTORIA GOES AHEAD WITH ITS PLAN TO OPEN POT SHOPS, THERE WILL BE GANG WARFARE. IT NEEDS TO TAKE A SENSIBLE APPROACH TO WEED. IF NOT, IT WILL BE NORTEÑOS VERSUS THE BIKER GANGS AND IT WILL BE UGLY. 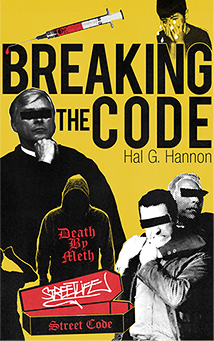 Drugs attract crime and crime equals gangs. Did you not notice the armed robberies and home invasions in Victoria in the last year? I spent some twenty years living in both Northern and Southern California. Also, I spent many of the last fifteen years living in the centre of the drug culture here on southern Vancouver Island. Therefore, I am well qualified to help you understand the “whys and wherefores” of what gangs will mean to Victoria.Let’s start with a quick history lesson on Norteños. As well, I will explain why it is here and what must be done to protect the south island from it. Who is Norteños and why should you be worried? When in prison in the USA inmates are virtually forced to belong to a prison gang for self protection. They need to do this in order to distinguish who might be an enemy and who might be a friend. Due to the various Hispanic inmates’ affiliations outside of prison, it became necessary for the Hispanic inmates to form gangs in prison. They did so in order to establish a protected identity. The Norteños (Northeners) is a Hispanic gang that started in the prison system in California sometime in the late sixties. At that same time, another gang was also formed, the Sureños (Southerners). One gang arose out of an affiliation of certain Hispanic inmates with Nuestra Familia (Our Family) which was/is the dominate gang in Northern California. The other arose because Hispanic inmates from the south needed protection. They formed an affiliation with the Mexican Mafia (La Eme), becoming Sureños. Consequently, they became the dominant Hispanic gang in Southern California. Bakersfield is the dividing line between Northern and Southern California. Thus. the dividing line between whether you joined Norteños or Sureños became Bakersfield. This is because Bakersfield and north thereof are principally farmlands and south thereof are principally urban areas. Thus, in prison, those inmates who came from Bakersfield or north joined Norteños. Then accordingly, those who came from south of Bakersfield joined Sureños. The Gangs Grew and Prospered Outside of Prison. As many of those inmates were released from prison over the four plus decades since those gangs were formed, they maintained their gang affiliations. Consequently, they then formed the Norteños and the Sureños outside of prison. At this time, each gang has a large number of members and each gang has a reputation for ruthlessness and violence. Differing Environments Led to Differing Expansion Plans. The Sureños, being in the urban areas of California, has easy access to dope flowing out of Mexico. This is because of the considerably larger population and sprawling metropolises in the south of the state. This gives it an ample supply of dope, customers and new recruits. On the other hand, the Norteños because of the more rural qualities of its territory has sought to expand to its north, even across the border, in order to sustain itself and to grow. Although the code pictured is for the Mexican Mafia (La Eme), all of the gangs from the USA have a very similar code. It is a brutal code and one that guarantees violence. This is what makes the incursion of Americans gangs into our communities so dangerous. You don’t just buy a motorcycle and sew a patch to a jacket and call yourself a member of an outlaw motorcycle club here in Canada. In the USA you don’t just slap on a tattoo and declare yourself a member of one of these American gangs. In the case of the motorcycle clubs here, you will get a severe beating. And in the case of the American street gangs, you will get dead. There is a procedure for joining motorcycle clubs here or street gangs south of the border. Additionally, in the USA you will likely be required to commit at least one murder. However, the initiation into a Canadian branch of any such American gang probably comes with less severe prerequisites. The Devils Army in Langford and throughout BC uses the number “41” to identify itself. The number “4” represents the fourth letter of the alphabet, “D”. And the number “1” representing the first letter of the alphabet, “A”, [“DA”, Devils Army]. 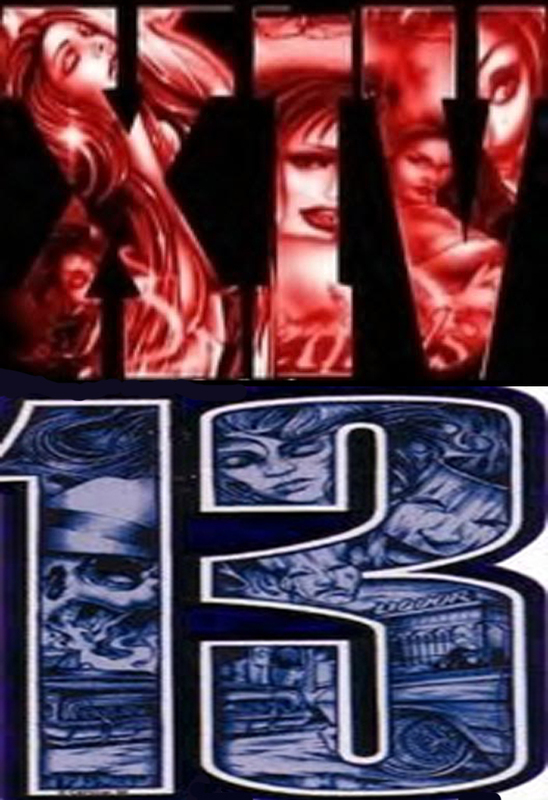 Sureños uses the number “13” to distinguish itself. The number “13” is used because the 13th letter of the alphabet is “M”. This letter stands for the Mexican Mafia (La Eme). This is the mother gang to which Sureños has sworn allegiance. Thus you will find many Sureños members inked with tattoos with “X3”, “13” and/or “M” as part of their identifying body art. On the other hand, Norteños uses the number “14”. The number “14” is used because the 14th letter of the alphabet is “N”. This symbol serves a double purpose as “N” stands for Norteños, as well as for Nuestra Familia, the mother gang with whom Norteños affiliates. Accordingly, you will find Norteños members with tattoos with “X4”, “14” and/or “N” or even with four dots surrounding a single dot [1 and 4]. Norteños also favors the color red. It wears red on everything from bandanas, to jackets, to shirts, and often even to shoe laces. Gang colors are often considered sacrosanct by members of a gang. It is not uncommon for an absolutely innocent individual to be beaten by Norteños because he or she might be wearing red, especially if that individual is Hispanic. From where is Norteños getting its dope here in Canada? When dealing in the USA Norteños gets its dope from Mexico through Joaquín “El Chapo” Guzmán’s Sinaloa Cartel. However, one must opine, given the small numbers of the gang trying to infiltrate lower Vancouver Island, and therefore, the correspondingly small amount of dope required when compared to what one might normally attempt to smuggle across an international border, that it is extremely likely, although by no means a guarantee, that Norteños is sourcing its dope locally. Perhaps it comes from one of the many gangs Stew Young has allowed to gain a foothold in Langford. Evidencing this viewpoint, I know of one longtime Langford resident who was arrested with Norteños members in the recent past. Also, please remember that a gang, as is true with an army, cannot extend past its supply line. Accordingly, Norteños must have a local supply of dope available to it from somewhere. As I described in my posting about the Vancouver Island drug chain, Langford is becoming a distribution point for drugs and a hotbed for gangs. This is because its focus on development has left it severely short on police. For instance, the extensive investigation conducted against Norteños would not have been possible in Langford, or for that matter in the West Shore, because there just did not exist enough police personnel to have carried it out. The Entire Southern Island is Paying the Price for Inept Planning in Langford. Sadly, unless and until Stew Young and company care enough about protecting the public and a new policing model is introduced in Langford, this situation will never be cured. Accordingly, Langford’s problems will continue to be exported to the neighboring communities. The Norteños gang is relatively new to the South Island. It first appeared about two years ago. Because of that fact it will be actively recruiting for new members. It will do so principally by seeking out younger and more naive individuals. It wants soldiers who can easily be indoctrinated into the gang way of life. These are the types of individuals found among the disenfranchised in tent city. Norteños wants to grow its numbers. It will do so through dope sales, break and enters and robberies until it becomes self sufficient. Initially, Norteños will hire out its services to more established gangs in Langford, gangs such as the Devils Army and other ethnicity based gangs, doing collections and drug rip offs for those gangs. This is NOT the Italian Mafia. Please understand that I am not talking about the mafia type of organized crime here. Instead, I am talking about dope slinging gangs with loose organization. These punks do drive by shootings and murder innocents who just happened to be in the wrong place at the wrong time. Here is further proof of Norteños presence in Victoria and the threat it represents. Norteños gang member arrested with weapons. Gang associate believed to be linked to Norteños gang is facing more charges. A 43-year-old Victoria man believed to have ties with a notorious California street gang was taken into custody. He faces a number of drug and firearm charges following a search of a North Park home last month. On Dec. 10, police searched a residence in the 1100 block of Empress Avenue. Inside, they found GHB, cocaine, heroin and methamphetamine. A pump-action shotgun, rifle, a significant amount of cash and other items consistent with drug trafficking were also seized. MARK MY WORDS, IF VICTORIA GOES AHEAD WITH ITS PLAN TO OPEN POT SHOPS RATHER THAN A SENSIBLE SOLUTION TO MEDICAL MARIJUANA, THERE WILL BE GANG WARFARE HERE. DEMAND THAT VICTORIA COUNCIL END TENT CITY AND NOT OPEN POT SHOPS. DEMAND IT WAIT FOR THE LEGALIZATION OF POT. THEN DEMAND IT ONLY SELL MEDICAL MARIJUANA AND RECREATIONAL MARIJUANA THROUGH PHARMACIES AND LIQUOR STORES. ANYTHING ELSE WILL BRING GANG WARFARE. If the city still insists on issuing licenses to pot shop, then you must insist that it do so with clear language. The license must state it is being issued on a “Temporary” and “Experimental” basis only. It should give the city the right to rescind the license with a thirty day notice. This right should be at the “Sole Discretion” of the city. And it should be for any reason the city might deem necessary. In this manner, the city can replace all weed shops with a superior distribution system when it realizes that it made a mistake. To not take this simple precaution would be Gross Malfeasance of its responsibilities. Here are some twitter addresses to which you could also send the link. 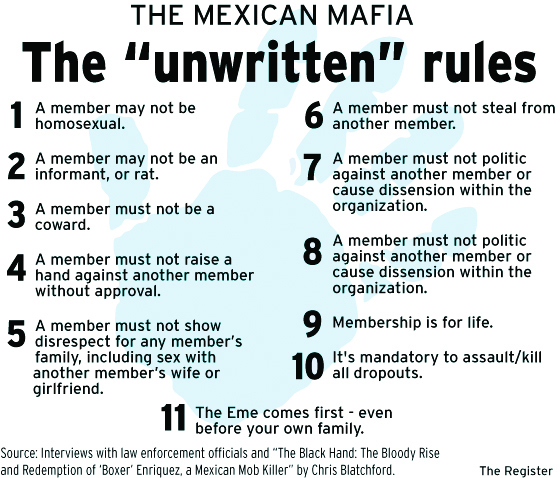 Listen up moron, the rules I posted are clearly titled “Mexican Mafia…” DUH! You know how to call people names, but before doing so I suggest you first learn how to read.